The entertainment line-up for the 2016 Spencer Pride Festival is a diverse group of tremendously talented artists. From honky-tonk to blues, from instrumental music to tribal dance, from choirs to gender-bending drag queens, we have a fabulous spectrum of styles for this year’s festival. As a reminder, all of our entertainment is 100% free, as is festival admission & parking. Please come support Spencer Pride and our entire schedule of performers by staking claim to a small piece of the courthouse lawn and making a day of Spencer Pride. It’s fabulous, fun, FREE, and of course, family-friendly (pets, too!). Entertainment begins at 10 AM and lasts through 8 PM on the Ivy Tech Bloomington Main Stage which is located on the south side of the Owen County Courthouse. We also have some additional entertainment taking place on the north courthouse lawn. Please note the extended hours this year, which are intended to help us celebrate our 10th birthday well into the evening. We are proud to have Sheryl Daniels returning as our emcee of entertainment this year. Sheryl brings a lot of experience with her and really helps to keep the audience informed and engaged throughout the day. Helping Sheryl will be special guest host Suzanne Westenhoefer. Suzanne is a well-known lesbian comic who has had her own HBO Comedy Special and has been featured on Late Night. 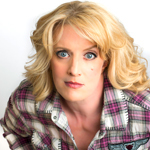 Suzanne will be sharing her comedy with the crowd the entire day. All times listed are subject to change. SarahJayne Balash has been pursuing a career in music since she has been 15 years old, whether she realized it or not. Her bluesy vocals, country roots, and folk writing style have pushed her into a unique category among today’s emerging artists. Her songs range from anything such as an awkward ukulele tune about feeding an ex-boyfriend to zombies to slow pieces that ultimately spell out heartbreak. She will be attending the prestigious Berklee College of Music next year, where she will major in Songwriting and be a part of the school’s vocal department. A musician of 20+ years who grew up in Bloomington, Indiana & studied under passing musicians from around the country as well as the world. Once part of a top ranked drumline in high school to playing in various ensembles at Butler University in Indianapolis to getting into performing and writing electronic music during his Masters at IUPUI, now Adam takes all of his knowledge of music from over the years to create a single sound and to share that sound to everyone he can. This is Adam’s first time performing at the Spencer Pride Festival. This is the second annual Spencer Pride Pet Parade. The parade will start on the south side of the courthouse and will travel clock-wise around the sidewalk around the courthouse. The parade will end up on the lawn in front of the main stage, where each contestant and their owner will be announced. Judges will review the contestants for color and personality and will award a GRAND PRIZE WINNER before wrapping things up. No registration is required for participation in the pet parade. The Quarryland Men’s Chorus provides a positive performance-based community for gay and bisexual men and their allies in South Central Indiana. We foster talent, fellowship, pride, and understanding through excellence in vocal music. The Quarryland Men’s Chorus has attended the festival several times in the past and is always a crowd favorite. Different Drummer Belly Dancers mixes traditional belly dancing and modern music, borrowing from cabaret, American Tribal, and Dunyavi Gypsy styles of belly dance. We believe the power, beauty, joy, and grace of belly dance can be expressed in our modern music. Different Drummer Belly Dancers have attended the festival previously and always get the crowd moving! The Spencer Pride Festival is the only place where you can see a drag show on the lawn of a county courthouse in Indiana. The show has been a long-standing tradition of Spencer Pride and has been going since the festival moved to the Owen County Courthouse square in 2008. The drag show is the result of a fabulous pairing of Vicci Laine – who coordinates the gals – and Steve Keith – who coordinates the sounds. Participants in the Drag Show usually aren’t announced ahead of time, but they never disappoint! This is a family-friendly event so everyone is encouraged to come witness the talents of the ladies of Spencer Pride! King Bee & The Stingers haven’t performed at the Spencer Pride Festival before & we are excited to have them for their first time. 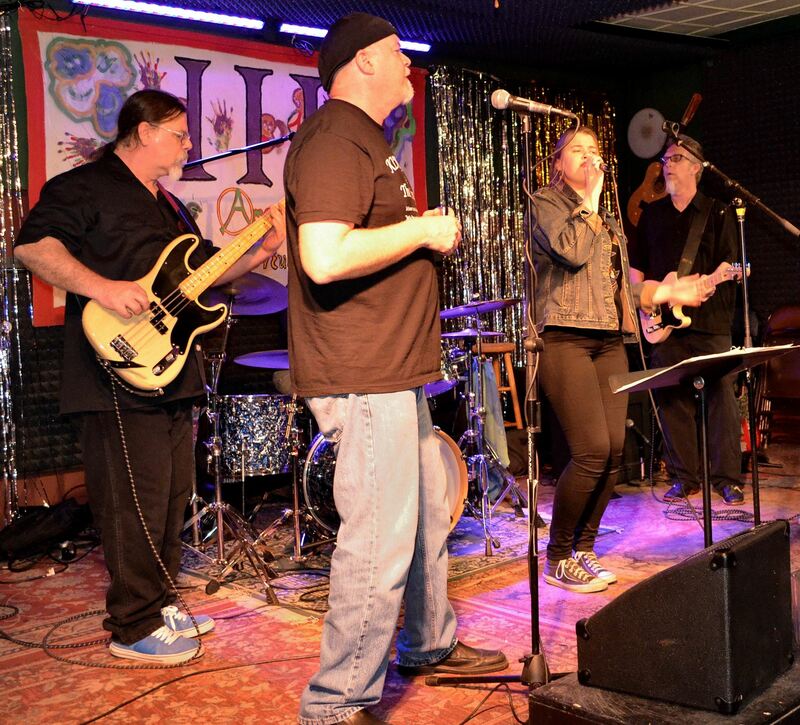 They are an indi-blues band that is sure to get the evening crowd moving. But wait, there’s plenty more! In addition to the live entertainment on stage, there is a LOT to do at the festival! Get your hands busy in the Prism All-Ages Activity Zone, where you can try jewelry or button-making, participate in our first-ever coloring contest (featuring an exclusive design from local artist Susan Shorter-Anderson), and more! This area is entirely organized and staffed by volunteers from Prism Youth Community, which is a program of Bloomington PRIDE. Zumba (with Nancy Emerson) will be a popular item to help work some of those calories off from the elephant ears! Need to cool off? Jump into our Wet-n-Wild Pride Slip-n-Slide (all-ages)! It’s the kind of fun you remember having as a child, but appropriately sized for adults, too! This is a free actitity, so don’t hesistate to use it all day! There are many more activities in our Family Fun Area this year. It will be more than twice the size of any prior year! Back by popular demand is our Dunk Tank! This activity was so popular last year that we’ve brought it back! Tickets for the Dunk Tank are $1 each or 6 for $5. If your talents don’t match your desire to send someone underwater, you can take the short-cut and pay just $20 to tap the button! Shop the festival marketplace, which includes our biggest selection of vendors ever. Whether you are looking to buy retail items or services, learn about local organizations, or get a bite to eat, there are plenty of options for all. In addition to the wonderful vendors in our festival marketplace, some of the local businesses on the square are also supporters of Spencer Pride. Those businesses will have bouquets of balloons posted prominently out front and we encourage everyone to stop by and check each of them out. Purchase official Spencer Pride merchandise at our new cart conveniently located in the entertainment area. This is the only place to get your 2016 Spencer Pride Festival t-shirt or our other exclusive items such as rainbow umbrellas. For the first time ever, we will also have a tank top option for our official festival shirt. We’ve barely just scratched the surface about what you’ll find at Spencer Pride this year. Come out on Saturday, June 4 from 10 AM to 8 PM. To learn more, keep checking back on our website SpencerPride.org. We are constantly posting new information about this year’s event and what attendees can expect.